I never would have guessed that Rampant Growth would have a more expensive tribal iteration one day. Heck, I probably wouldn’t have guessed that Rampant Growth wouldn’t be in Standard one day (without a variant along the lines of Cultivate). Regardless of all that, though, this might be close to the number one ramp card in dinosaur tribal decks. Rampant Growth is less fragile to the ubiquitous creature removal (compare Drover of the Mighty), and you can use it to search out any color/s you might be splashing for useful off-tribe cards. And there’s always the intimidation factor of using your second turn to show your opponent what scary dinosaur you’re ramping into. 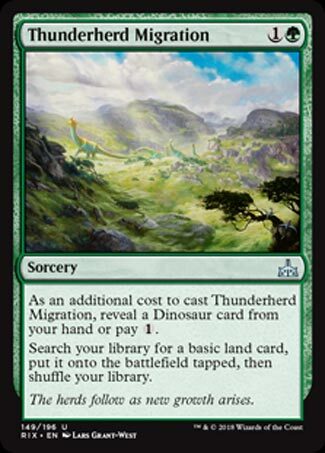 Isn’t it weird that Savage Stomp (Dino Might) costs less if you have a dinosaur yet Thunderherd Migration costs more? I know the reason is because its part of a cycle but its still small enough to bug me. Rampant Growth was one of my favorite card when I started playing. The spell puts you ahead a turn, grabs you another color, and thins your deck. Considering it has been over half a decade since that iconic card has been printed in Standard, its clear that Wizards thinks its too powerful. So now we have years of “worse” Rampant Growths such as “Ruin in Their Wake” and today’s card. It’s pretty obvious what slow and lumbering tribe you should play this card with. Despite not being able to color fix, Kinjali’s Caller and the like are probably the better option for getting dinos out fast. But humans are lame and Zacama wants as many lands as possible. It’s mostly a worse Rampant Growth! Mostly. It’s still pretty good with Dinosaur decks, and Rampant Growth is a playable card in Standard, particularly after Attune with Aether got banned. It’s not flashy, but it’s a good tool for helping the slowest Ixalan tribe bridge the gap to the late game.